Once they had received Mahaprabhu’s blessing, Caitanya Das and his wife returned home and when the auspicious moment came, a son was born to them who was named as “Śrīnivās”. Caitanya Das immediately offered the child to Mahāprabhu. Later, when Caitanya Das left his body, Śrīnivāsa took his mother and moved from Chakhandi to his maternal grandfather’s house in Jajigrama. Recently, students from Māyāpur Institute (MI) participated in Jajigram Festival organized by Bhaktivedanta Charity Trust. This was the inauguration ceremony for a newly constructed temple at Śrīla Śrīnivās Ācārya’s bhajana-kuṭīr. Jajigram is the sacred place where Śrīnivās Ācārya used to carry out bhajans with Śrīla Narottam Das Thakur and Śrīla Rāmacandra Kavirāja. Over the years, unfortunately, the maintenance of this bhajan-kuṭīr has declined. Thus, inspired by HH Jayapatāka Swami Maharaj and his wish to fulfill Śrīla Prabhupāda’s desire to renovate the holy places of Śrī Navadvīpa Dhāma, the devotees of ISKCON Māyāpur, under the Bhaktivedanta Charity Trust, have constructed a very beautiful temple at this place. Leaving from the ISKCON Māyāpur campus at 6am, devotees arrived at Jajigram in the morning excited to visit this holy place in the association of senior devotees. The festival began with a vibrant harināma and was received with much enthusiasm and respect from the local villagers. As the harināma party proceeded through the streets, local women left their homes to pour pots of water in front of the saṅkīrtana maṇḍala, thus washing the road before devotees walked upon it. With even more humility, they paid their obeisances as devotees danced through the streets. 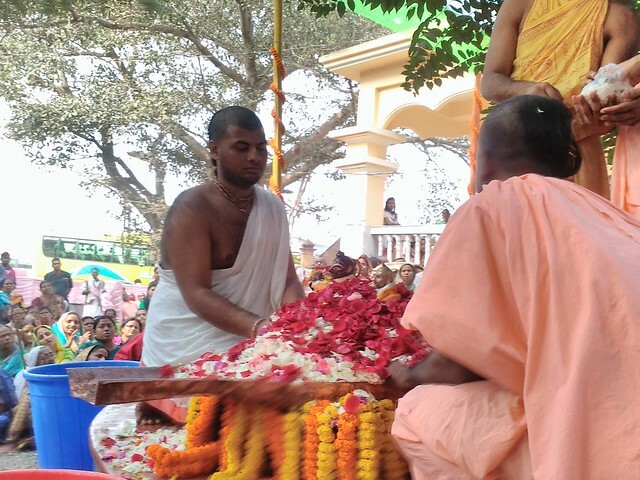 Their exemplary actions demonstrated the pure nature of Dhamavasis, who from childhood are so fortunate to be able to learn about the pastimes of Lord Caitanya and associate with His pure devotees. The harināma was followed by a beautiful abhiṣeka ceremony for the Rādhā Kṛṣṇa deities which were personally worshipped by Śrīla Śrīnivās Ācārya. This was then followed by lectures on the wonderful pastimes of Śrīnivās Ācārya and his associates. Devotees were fortunate to hear from many senior devotees such as HH Bhakti Puruṣottama Swami Maharaja, HG Jananivās Prabhu, and HH Bhakti Nityānanda Swami Maharaja. Although HH Jayapatāka Swami Maharaja was unable to attend, devotees’ hearts were warmed to hear a personal message from him. After taking prasādam, devotees had the opportunity to visit Śrīkhaṇḍa, the birthplace of Śrīla Raghunandana Ṭhākura. In his childhood, while Śrīla Raghunandana Ṭhākura was offering bhoga to the Lord, the Lord personally appeared to accept the offering. Devotees had the darśana of the deity of Lord Caitanya which was worshipped by Śrīla Raghunandana Ṭhākura.